A few weeks ago, the media was reporting that a group of young, engaged Alberta conservatives were forming the Alberta Blue Committee to open discussions about uniting the "right of centre" political views. As a PCAA member with a large number of friends that have migrated to the Wildrose Party, I will admit that this concept intrigued me. 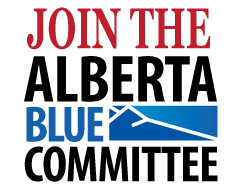 Today, the Alberta Blue Committee has officially launched. I had the chance to ask founding member Ken Boessenkool some questions about this group, which he has answered below. Can you give me some background on the creation of “Blue Committee” concept? We started thinking about it earlier this year when a number of concerned conservatives with friends on both sides of the PC – Wildrose divide wondered how to continue to contribute to the debate. Many of us had felt that the province had been drifting for some time, and what was needed, beyond new leadership (which was underway for the PCs and was the desire of the Wildrose)was someone to have a conversation about uniting the right in Alberta. The other motivation for me was that I was part of the Reform Party in the early1990s when we pushed Humpty Dumpty off the wall, and was also part of the Harper team that put him back together and ultimately won a majority government in 2011. While the Reform Party played a critical role in Canada, in my view it took much too long to pull things back together. Alberta is potentially at the early stages of this long journey. And I thought if we set up something early promoting unity, it might not take quite so long to pull things back together if they start to fall apart. I also wanted to create a home for folks who had a deep respect for both the PCs and the Wildrose. As I like to say, I really don’t want to chose between my good friend Rob Anderson and my good friend Doug Griffiths. Is there any precedence for a similar concept/group in Canada? There was a federal Blue Committee in the late 1990s that operated within the federal PC party. As a group they merged with the Reform Party (along with many Harris and Klein Progressive Conservatives) to create the Canadian Alliance. Before that occurred, they existed to push the federal PC party to the right. What does the committee membership make up look like? We are all next generation committed conservatives. What does the committee hope to achieve? A single right of centre political alternative is our long run goal. Good right-of-centre policy is our immediate focus. What are some of the challenges that this committee will have to overcome? Some people think we are creating another party – but we want one right-of-centre party, not three. Some people want us to choose, to fish or cut bait. Many of the folks involved are on one side or the other, but have respect and a long term desire to be united.I think creating a “middle ground” where we can have policy discussions and talk about paths to unity will be beneficial in the long run. People can follow us on Twitter, like us on Facebook or join us on the website. I'll definitely be watching this group with interest as it is something that I am passionate about also. More Problems In The Wildrose Nomination Process?